There are no two ways about it: landscaping is a major investment. It can also be a significant upgrade to the appearance, curb appeal and value of your home or business property. Whether you’re preparing to improve you backyard or your company storefront, it makes sense to choose landscaping material that is low maintenance, durable, attractive and increases your property value. We have a solution that we can sum up in a single word: concrete. Most real estate professionals would agree that hardscape – including concrete – adds to the value of your home or business. Creative projects done with concrete are not only aesthetically pleasing, they also represent a significant investment in the property. Potential buyers recognize the benefits of concrete, so it adds to the value of your property. Unlike some landscaping options, concrete is extremely durable no matter what the weather conditions may be and no matter what type of foot traffic it has to endure. When it comes to creating an attractive home patio or outside common area for your business, there’s no match for decorative concrete. When properly maintained, concrete can last for many years – sometimes even decades – before it needs to be replaced. 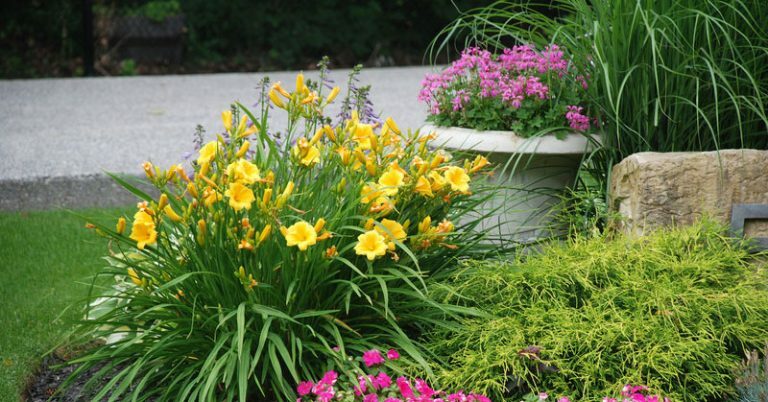 Incorporating a variety of beautiful plants into your landscaping plan will most definitely enhance the appearance of your outdoor space. But greenery can also require a lot of care. Not so with hardscape! Decorative concrete not only improves the appearance of your landscaping, it requires only a minimal amount of upkeep. Simply keep it clean by sweeping and/or occasionally hosing it off, and secure the services of a trusted paving professional who can provide periodic maintenance to keep your concrete intact for many years to come. When it comes to choosing decorative hardscape for your landscaping plan, concrete may not be the first material that comes to mind. But many paving contractors offer a variety of concrete options, from different colors to stamping and a whole host of other options. Now, you can enjoy all the benefits of concrete and improve the “eye appeal” of your landscape at the same time! For more information about all the advantages that concrete can bring to your home or business landscape, contact a reputable local paving contractor. When it comes to any type of paving project, it’s always best to choose a local company – one that understands your climate and can help you to maintain your pavement properly for many years to come. Concrete might just be the landscape answer you’ve been looking for!